Dr Beth Breeze, Director of the Centre for Philanthopy, was delighted to receive £10,000 from Blackbaud to support two scholarships for excellent students who wish to register for the MA Philanthropic Studies. For almost 40 years, Blackbaud has been developing software and services for not-for-profit organisations. They are offering the scholarships as they value the importance of fundraising education and recognise the benefit of strengthening provision at Kent to support good practice across the UK. Fundraising is widely understood as an essential but complex role, for which most practitioners lack appropriate and substantive training. Research shows that the vast majority of UK fundraisers learn 'on the job' and with the benefit of very minimal in-job training, such as one day courses and reading trade magazines. These scholarships will ensure the programme is as accessible as possible to meet the widespread demand for trained and talented fundraisers by making it affordable for charities and fundraisers. 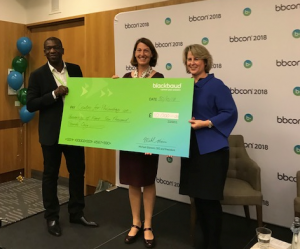 Dr Breeze said "We are thrilled to receive this generous funding from Blackbaud, who share our desire to help professionalise fundraising in the UK".